Quite a challenge fitting all of those hobbies on but the recipient was suitably chuffed! 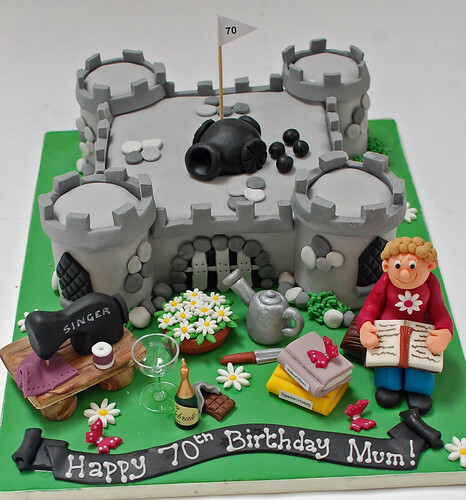 The Medieval Castle Cake – from £100. Wow!!! My mum absolutely loved her cake, she was so amazed by the detail. Mandy your cake making skills are truly amazing!!! I just gave you the brief about my mum and you did a cake which was absolutely perfect! My dad’s fishing cake previously was also amazing. Thank you so so much for a fantastic cake which not only looked stunning but tasted fabulous too, thank you. The castle cake for my wifes 70 Birthday was amazing! She was so pleased. Our daughter Nicky left the cake in our kitchen to see when we arrived back from a trip to Thornbury Castle which she also arranged! Such a surprise and fantastic, especially all the various hobbies displayed! I must say it did bring a few tears. The detail was so very good even down to the titles on the books displayed on the spine, terrific touch. As a bonus the cake was delicious. Shared turret by turret with the family. The hobby parts are being saved together with the cannon for as long as possible to relive the memory~ thank you so much. It was without doubt an inspired piece of art work!